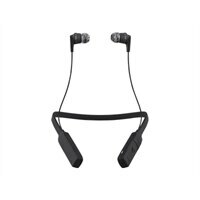 Skullcandy INK'D WIRELESS - Earphones with mic - in-ear - Bluetooth - wireless - noise isolating - gray, blackThese Earphones are lightweight and low-profile around-the-neck collar. Bluetooth® wireless with 8-hour rechargeable battery. Call, track and volume control via the built-in microphone and remote.